Wabad päevad is open to the public, and Pixelache artists will be short-term artist-in-residence at Wabalinna maja's recently launched residency programme, built through the research and discussions of the AMRT network since 2014. In addition to the workshops and presentations by AMRT participants, there will be a meeting of Estonian-based non-profit organisations seeking to collaborate and a concert by folk-electronica artist Mari Meentalo. All are welcome! If you need additional information, contact john at pixelache.ac. AMRT is supported by Kulturkontakt Nord's short-term network funding. 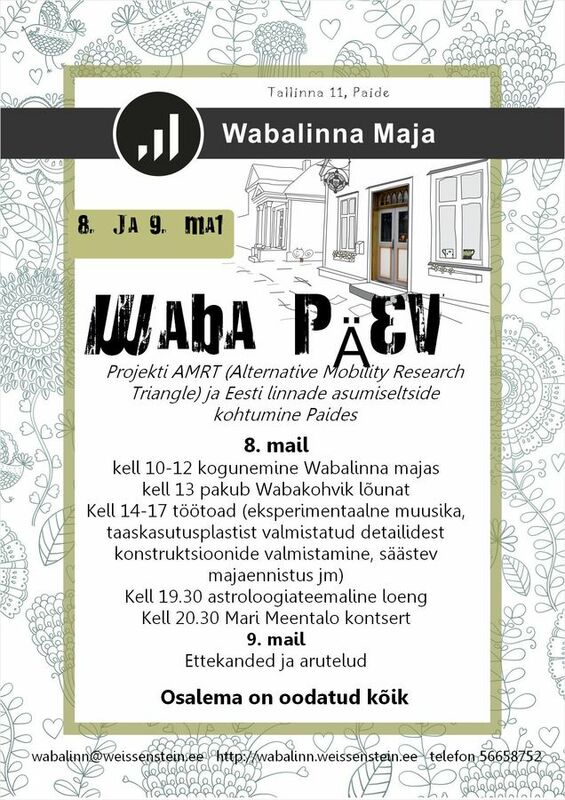 Wabalinna maja - The future of the Arvamusfestival - what could be "alternative" topics and formats? In this workshop you will learn how to create a sound generator which transform sound parameters according to light conditions. It can be used as a portable instrument to take outside and listen to subtle changes in the sunlight. The generator is built with simple electronic components and can be completed in some hours. Participants don’t need to have prior experience with electronics, however its encouraged that artists who work with sound and or light take part in this workshop. A performance around light and sound will happen once generators are completed. What does it mean to survive? Beyond the basic necessities of financial survival, food, and shelter, what do we require on a creative and personal level? What survival strategies do we construct not just for ourselves, but in our various networks, professional collaborations, and sociel enviroments? This participatory discussion continues from a workshop conducted in Mooste, Estonia in 2014 with Tanel Rander. Mia Mäkelä will discuss her experiences in the world of science and the third culture - art trend. Artistic work increasingly often resembles scientific research; art galleries and film festivals curated by scientists are on the rise. The term 'third culture' was coined in the 1960s and refers to the merging of art and science. The lecture is also an opening for discussion about new ecological concepts for AIR (artist-in-residence) programmes.